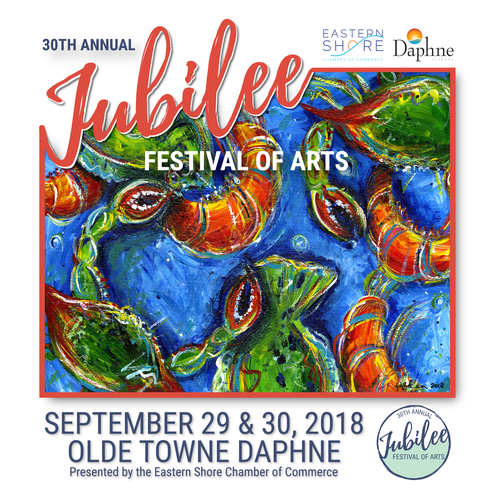 The 30th Annual Jubilee Festival of Arts is set to attract thousands to the oak-lined Main Street of Daphne, Alabama on September 29th and 30th. Art, music & seafood meet southern charm at this annual festival set along the Eastern Shore of Mobile Bay. 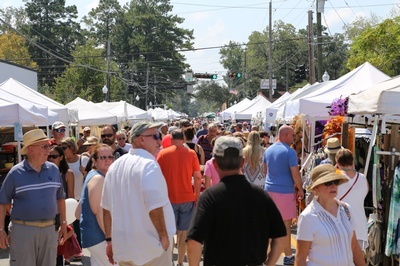 The Eastern Shore Chamber of Commerce hosts this family-friendly festival each year in coordination with the City of Daphne. 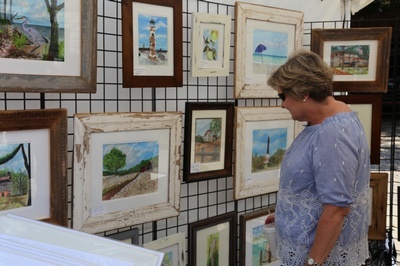 ARTS & CRAFTS VENDORS: Visit nearly 100 arts and crafts vendors showcasing the very best in jewelry, paintings, pottery, sculpture, wood, mixed media, functional & decorative items. As a juried art show, vendors are competing for cash prizes which will be awarded Saturday night. It's not too early to start thinking about Christmas presents you won't find anywhere else. HIGH SCHOOL ART EXHIBITION: New this year, up-and-coming artists will be on display in the High School Art Exhibit presented by Riviera Utilities. Their work can be found in the Jubilee Courtyard next to the Pigeon Hole. This is an opportunity for high school art students to compete, exhibit their work and earn prizes. It is also a great way to showcase the wonderful artistic talent found in the high schools located on the Eastern Shore. 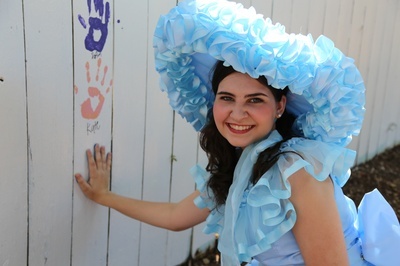 KIDS ART PARK: A festival favorite, the Kids Art Park presented by Family Security Credit Union will once again be completely free for families thanks to the festival's generous sponsors. Children will be able to paint their handprints on the fence, make jewelry, construct a wooden block sculpture, have their face painted or even bring home a fish print. WORLD FOOD CHAMPIONSHIPS QUALIFIERS: Chefs will face off in two World Food Championships Qualifiers in the Sandwich Category & Preferred Chef. Winners will take home a golden ticket to participate in the World Food Championships at the Wharf in November. Food competitions will start at 2 p.m. each afternoon in front of Daphne City Hall. FOOD: Not only can you visit our eclectic food court offering festival favorites, but Olde Towne Daphne is teeming with many delicious restaurants ready to service festival guests. 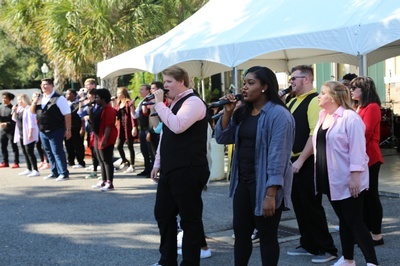 ENTERTAINMENT & SOUTHERN MAKERS: The Thomas Hospital Entertainment Stage will be filled with local talent and you may see a few new faces with pop-up shows & performances in the streets. We will also showcase our local southern makers. Craftsmen will walk you through their craft and answer questions during their demonstrations.